375ml waxed bottle poured into a tulip appears black in color with a 3+ finger froth that fades leaving patchy lace. The head on this almost has a slight purple stained aspect to it. 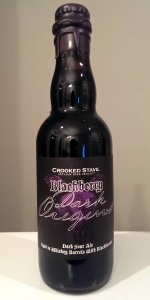 The aroma is filled with berries, seedy and earthy with sour indication. Really nothing to speak of regarding barrel or dark grain essence thats so evident in appearance. The taste is tart with berry flavoring, a bit seedy and earthy with moderate roasty grain inclusion leaving an aftertaste of coffee and roast/earth. This is medium to lighter in body with modest carbonation. A pretty nice brew but the acidity starts to become taxing half way through the glass. Glad to have tried it but not sure I need more of this in my life. Dark sour with blackberries. Medium fruitiness, minor roasty malt presence, with a pretty clear and present sour streak. The crooked stave signature funkiness is there but is slightly overshadowed by the above average sour streak on this one (perhaps due to this being an older bottle?) Would love to have tried this closer to its birthdate but still pretty darn tasty.